Russia will invest US $800m (£527m) into a new spaceport in the country's Far East, Prime Minister Vladimir Putin has announced. 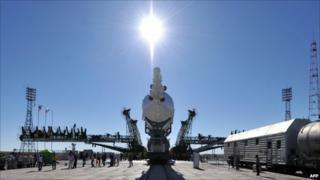 The move is meant to ease the dependence on the Baikonur launch site in Kazakhstan, built during the Soviet-era. The future cosmodrome will be built near the town of Uglegorsk in the Far Eastern Amur region, close to the border with China. "The government has made a decision to earmark 24.7 billion rubles ($809m) over the next three years for the start of the full-blown construction of the Vostochny cosmodrome," Mr Putin said. Vostochny means "eastern" in Russian. The head of Russia's federal space agency, Roscosmos Anatoly Perminov, said that up to 30,000 specialists would build the new space launch facility. He also noted that it will be smaller than Baikonur, which Russia rents from Kazakhstan. "It will be a least costly and a more compact site," Mr Perminov noted, comparing the new site with Baikonur, which is the largest and oldest space launch facility in the world. The new space port will cover some 700 sq km and will contain new launch pads, a high-tech residential compound and research laboratories. Earlier, Mr Perminov mentioned that Russia hoped to launch its first space vessel from the new port as soon as it was completed in 2015, and a first manned flight is planned for 2018. Mr Putin stressed that the new site will be mostly for civilian launches. "I very much expect that Vostochny will become the first national cosmodrome for civilian purposes and will guarantee Russia full independence of space activities," he said. "It is important that the cosmodrome effectively ensures the operation of all future space projects," the Russian premier added. Russia plans to build a new generation of space vessels that could also be used for interplanetary flights - in particular, for a voyage to Mars. Engineers are supposed to start designing Vostochny's launch pads, assembly and testing sites as early as next year. The main construction work is planned to take place in 2012. Russia's space agency's first deputy chief Viktor Remishevsky said the cosmodrome was meant to ensure stability of the Russian space industry by giving the country independent access to space. Putin also encouraged more international co-operation, mentioning that the Russian segment of the International Space Station (ISS) should be completed by 2015. "In early 2011, the Russian Soyuz launch vehicle will start operating at the ESA's French Guiana Space Centre in Kourou. Later, the Phobos-Grunt Russian interplanetary spacecraft will put a Chinese space probe in orbit around Mars as part of our programmes to explore deep space," he stated. With the US shuttle programme being phased out in February 2011, the only means to get to the ISS will be by the Soyuz spacecraft.